An introduction to wrongful convictions and how they might be challenged describes how innocent people can be wrongly convicted, how the criminal appeals system can fail and even obstruct the overturning of convictions given to the innocent. It details how alleged wrongful convictions may be investigated and appropriately challenged, providing a six-stage methodology for such a task. The book by Dr Michael Naughton (with Gabe Tan) is underpinned by a decade of academic work on wrongful convictions and practical attempts to overturn alleged wrongful conviction as part of his work with the Innocence Network UK (INUK) and the University of Bristol Innocence Project. Funding for the book, published by University of Bristol, ISBN 978-0-9561001-3-9, came from the first-ever award made by the University of Bristol’s Impact Development Fund. 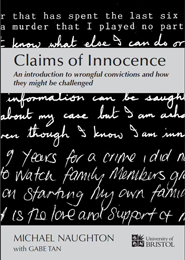 5,000 copies of the book were printed by LexisNexis for free distribution to UK prisons, sitting MPs and organisations in the UK and around the world that assist alleged innocent victims of wrongful convictions. The book is also available as a free download. See also: review in Journal of Healthcare, Science and the Humanities 1(1): 157-160.